This and previous lessons have information about some historical places.. So I posted this map for you to better visiualize the events..
Gordion was the capital of Phrygians who lived in central Anatolia in 1100-200 B.C. Gordion is famous with its Knot and its King..
One of the kings of Gordion dedicated his chariot to Zeus with the yoke tied to the pole in a special knot and declared that whoever can untie this knot will become the king of all Asia.. Many people tried to untie without success. 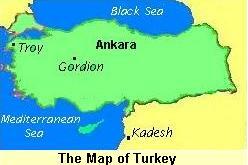 Later, Macedonian King Alexander the Great came to Gordion in 334 B.C. 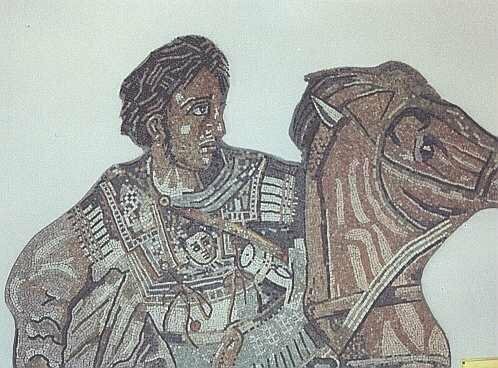 According to legend when Alexander the Great came to Gordion he looked at the problem from a different perspective and resolved it quickly by slushing the knot with his sword. Now, cutting the Gordion Knot came to mean solving a difficult problem..
Phrygians king Midas is famous with his touch: According to legend King Midas turned everything into gold with his touch. 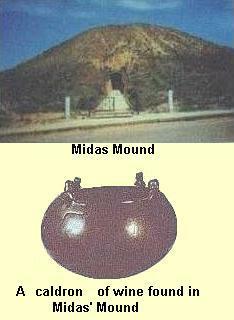 In 1957 archaeologists from the Pennsylvania University discovered Midas' tomb in Gordion (Turkey). The tomb was encased in a wooden chamber which was covered by artificial hill (tumuli). Burnt objects that surrounded Midas were not gold. They were all bronze cauldrons, jugs, vessels, bowls etc.. These were the leftovers of funerary banquet eaten by the mourners.. Archaeologists looked at these leftovers from different perspective: They used modern chemical techniques to analyze the leftovers. These analyses revealed what the mourners had eaten and drunk 3000 years ago: Spicy lamb, lentils, goat cheese, olive, honey, dried figs, barbecued meat and of course delicious Anatolian wine. Anatolian wine was very famous in ancient times.. Did you know that Julius Caesar, after a speedy battle in the Black Sea region of Turkey, quaffed a cup of fine local wine, and proclaimed his celebrated words, "Veni, Vidi, Vici (I came, I saw, I conquered). Later, Julius Caesar kept ordering delicous Anatolian wine for his dinner parties. 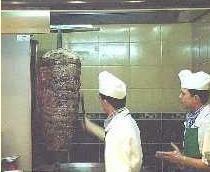 I don't know how many Turkish foods were consumed during history, but, I am sure that our famous fast foods "döner" (revolving kebap) and "lahmacun" (Turkish pizza) will become the most popular fast foods around the world in the future..
"Unbelievable! Our intergalaxial famous and delicous fast foods lahmacun and döner were also known by human kind 3000 years ago (in 21st Century).."
Bridge would be a dull game if it was played in a single, simple way... In this lesson you will learn how to look at your hand from different perspectives and solve the problems with your suit like Alexander the Great solved with his sword (see Gordion Knot at the left). During play keep in mind that there can be a better solution other than the solution in your mind. West leads A and follows with 7 in a six diamonds contract. Now, declarer can count 11 tricks, in the shape of: two spades, seven diamonds and two clubs. The contract seems depending on the finess of the queen of spades.. So, declarer wins 7 in hand. Clears trumps. Plays ace of spades and seven of spades intending to finess the queen. This is lost to West and contract will be defeated..
Declarer made a mistake by not looking for another chance: Since he has enough entries he should try to drop ace of hearts in three rounds before trying finessing the queen of spades. Since he has enough entries, he can easily ruff three cards in hearts. When East drops A, dummy's K will be a master for a spade discard..
West leads J in a six hearts contract. Now, declarer can count 11 tricks, in the shape of: 1 spade, five trumps, two diamonds and three clubs..
West leads J, North plays Q, East K and South wins with A. South then plays two rounds of trumps.. Then, intending to ruff the third round of diamonds, he plays ace, king and 9 of diamond.. West ruffs and plays 10 to defeat the contract..
Declarer made a mistake by not looking for another chance: If he looked for other ways to play the game, he would see the wining power of 9 8. "Start to make a better plan, as soon as you finish your best plan"